← What Is The Owl/Minerva Rule? Wikileaks; Trump; Clinton; Libyan Civil War; Anti-US EU-Centric #Pizzagate New World Order! 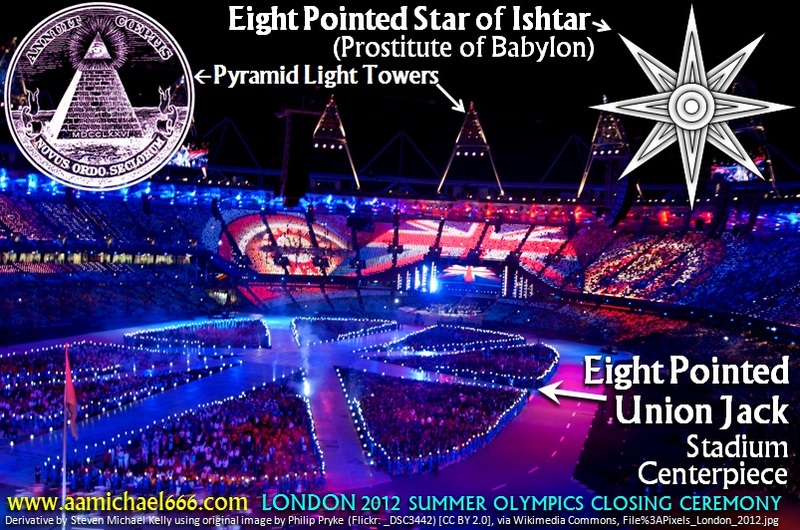 Another massive fire ritual at the 2012 Summer Olympics Closing Ceremony. and then a female dancer and 4 male ‘lovers’ performed a Phoenix ritual. The use of repdigits such as 111, 11, 22, 33, 44, 666, 777, or 7777, is extremely common in occult ritual, because repetition is a sacred way of compounding the symbolic meaning of an underlying numerical signature. Numbers are a universal language which defies the usual boundaries of human communication. This is a form of occult semiotics used to communicate intent and meaning, but only for those people who are looking for it. For everyone else, it just looks coincidental, and for schizophrenics, it appears as many times per day as they want it to, due to a lack of filtration and scepticism. There is a fine line between being and adept or a cunning occult genius, and total insanity. I’m still trying to work out which one applies best for Aleister Crowley, but it may just be that both cases apply. We should never confuse deeply intelligent evil with insanity, however, because to do so is to turn our civilizational backs on the greatest enemy of true Order — temporal and divine. BELOW: The esoteric city map (actually a geo-spatial Masonic Tracing Board) on the floor of the 2012 London Olympic Stadium, which was covered over during the opening and closing ceremonies, but which was especially captured for Google Earth, just to hide in plain site a BIG secret for anyone who might be paying attention, which was hiding esoterically beneath the set-prop landscaping. SO WHAT WAS THE BIG SECRET? If the exact center of the map was located in high-resolution (as I did), and the location on the Earth’s surface retrieved, the location is revealed to have been in South Quay on the Isle of Dogs: Specifically the exact location of the February 9th 1996 Docklands Bombing, perpetrated by the Provisional IRA, which broke a seventeen month ceasefire. A few months later the IRA detonated a truck bomb three times the size, in Manchester, the biggest bomb detonated in Great Britain since WWII. Now, this location and event was even more special, because as very few people will be aware, this bomb blew up the official 19-storey WTCA London World Trade Centre complex (EBN#138913), which was the official sister complex of the Twin Towers WTC in New York City that was destroyed ‘by box-cutters, and airplanes’ on September 11th 2001. The WTCA was headquartered in NYC, but at this location in London, the second most important WTCA complex was situated, and destroyed by the Provisional IRA. So why would the organizers of the London 2012 Olympics have gone to the trouble of paying big bucks to produce what they called a ‘live map’ of London (A Daily Mail article on the creation and apparent intent of this ‘live map’ can be found HERE) on the central stadium floor, if they were just covering over it with theatrical stages? Also, why did they feature at its centre, the location of a London WTCA complex terror attack? Answer: Occult semiotics … esoteric communication. But what does world trade and finance have to do with terrorism? Well, that’s a very big question, with an elaborate wide ranging answer, but the short answer is … EVERYTHING! All power grows out of the barrel of a gun; the governments guns, and it’s better if they’re pointing it at a mass of disarmed cattle trapped in a national security and surveillance state. Also, central banking is built on warfare. Cassus belli are the bedrock of foreign policy manipulations perpetrated by financial syndicates preying on sovereign states. Bond salesmen need debt creation in order to keep the global plantation profitable, and private Military Industrial Complex actors don’t sell baked beans, they sell weapons, for wars, for profit. No wars, no profits. Who owns these large ‘defence’ corporations? Financial syndicates do. Most of whom are a rentier class of parasites. Blowing people and stuff up is surely not civil and constructive to the masses of human cattle being farmed and persecuted. NOTE: The O2 Dangerous Woman concert on May 25th 2017, is exactly 7777 days since this terror bombing indicated esoterically on the 2012 London Olympics floor map, on which a Phoenix-44 Whore of Babylon Ritual Mass was performed for the world to watch. Thus, the below additional details of esoteric interest regarding this performer – Ariana Grande – add further weight to the possibility that the May 22nd 2017 Manchester bombing was just a warm-up, and that the BIG ONE is coming for the 44th city of her tour after the first concert at Phoenix; London! This post is incomplete, but has been posted on May 24th in case it can alert someone (anyone?) of the impending danger, and perhaps save at least one life. The O2, with its massive enclosed dome, would be a chemical weapons target par excellence. A chemical attack of perhaps sarin gas, set off strategically under this dome, could kill way more people than a conventional bomb like the Manchester incident. The O2 arena seats a total of 20,000 people, and it is likely to be at full capacity. Let us pray that I am wrong, and this is all just a BIG coincidence or a bad case of confirmation bias; which I would be quite happy to have fallen victim to rather than such an evil event being perpetrated by the Illuminati in such a callous very long-thought-out manner. In any event, if I am right, the Mass of the Phoenix is a SELF-SACRIFICE rite, so it would be extremely likely that the Kabbalah practicing (she wears the scarlet cord, as does Madonna and other Illuminati pupets) Ariana Grande herself, would be a necessary victim for the sacrificial rite to hold satanic efficacy … her name ARIANA = 44, which makes her the Phoenix … the ‘mother’ that esoterically needs to ‘feed’ her ‘children’ (fans), and the wider world who will be participating in the ritual with their eyeballs and ears. Forgive my language, but this is exactly what satanic Thelema is dogmatically all about; for instance, the highly Phoenix related symbolism of the Pelican of Rosicrucianism, which literally feeds its young with its own blood (sacrament). I will endeavour to update this post on the 25th, or afterwards if the event unfortunately transpires.